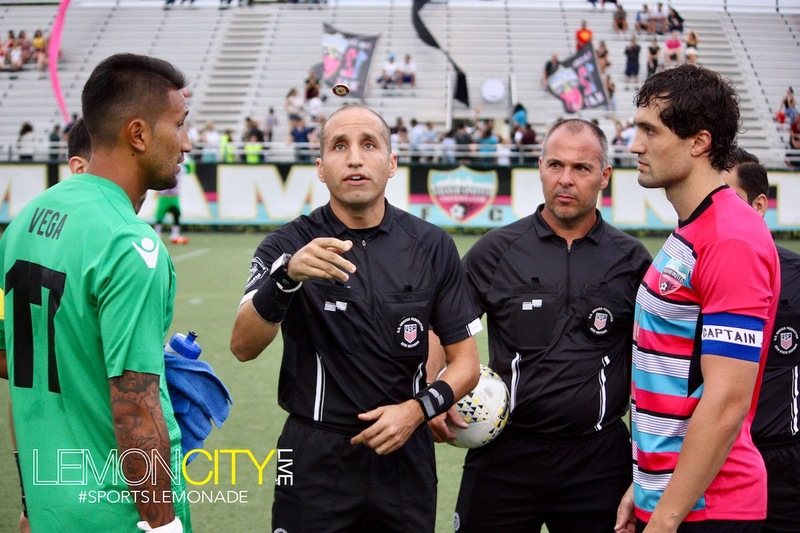 Hialeah, FL – There was a lot of hype going into this game between The Miami FC and Miami United FC. Kudos to the Miami FC for finding a silver lining in the whole NASL debacle. This Magic City Clasico rivalry isn’t so much putting makeup on a pig, but more like taking your average looking family to the Sears Family Portrait Studio. It ain’t great, but when it’s over you realize you had a lot of fun! There were a lot of typical Miami side stories to the match. The match was called late in the game due to lightning. Girls in short dresses had a halftime penalty shootout with Fernando Fiore as the goalkeeper, who was also trading panini stickers with fans. A high school marching band played the best version of the SportsCenter theme song I’ve ever heard. A player had to wear a jersey with his name and number written in marker. Also, I couldn’t find any water to drink, but there were plenty of corona’s. The showdown took place at Milander park in Hialeah, FL. It was a home game for Miami United FC, who finished in 2nd last season in the Sunshine Conference of the South Region in NPSL. After dominating NASL last season, most thought Miami FC would run through NPSL, but that was not the case. The first half was a wash. Both teams had opportunities, but neither capitalized. Miami United scored 1st in the 2nd half. In the 46th minute, Daniel Vega made one of the most amazing saves I’ve ever seen, but Victor Pelae tapped in the rebound. In the 72nd minute, Stefano Fanfoni had the ball all alone inside the penalty area, with a wide open net, but his shot probably ended up orbiting the Earth. There was a collective facepalm all throughout Ted Hendricks Stadium. But, if you like sandwiches, another word for a sub, is a hero. An injury laden Miami FC was able to sub in Jaime Chavez and Sean McFarlane. In the 90th minute, McFarlane sent in a long range forward pass with impeccable precision. Chavez made the run and connected a header into the bottom right corner of the net to equalize the match. This is the point where the referee decides that it’s too dangerous to play the extra however-many minutes of extra time would’ve been given, on account of lightning and bad weather in the area. The game ended in a 1-1 draw, but don’t fret. In less than a week, we’re doing it all over again! This time, Miami FC will host at St. Thomas University. I hope you’re ready for another Magic City Clasico!